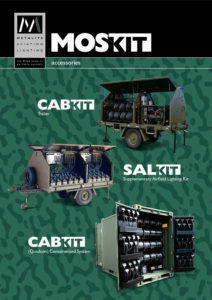 CABKIT is a cabling system which is used in conjunction with the MOSKIT and SALKIT portable airfield lighting systems. It connects portable runway lights or portable taxiway lights deployed from the MOSKIT and SALKIT trailers to a generator or mains power source allowing extended periods of continuous operation. 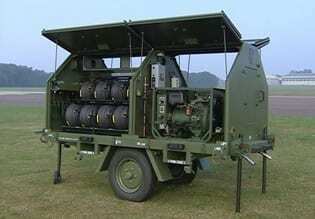 By connecting the ORELs deployed from MOSKIT and SALKIT portable airfield lighting systems to a continuous power source CABKIT removes the need for them to be returned to the trailers for charging. Power can be supplied from the generators on the MOSKIT and CABKIT trailers, from a centrally located field generator or by mains power. Once CABKIT is in operation it will directly power the ORELs when they are in use or recharge their batteries when in stand by mode. In the event of a power outage or a lighting circuit failure the ORELs revert to battery power so that air operations are not affected.